I nearly didn't go. The weather has been so poor recently that I found myself questioning the sanity of anyone staging a garden show in mid April. At the eleventh hour though, my own sanity prevailed and I contacted the organisers for a pass which they produced with lightning speed. And that was the first thing that struck me - this inaugural show seemed very organised and efficiently run; well thought out, attention to detail, appealing and entertaining. It was an excellent start for a new show. 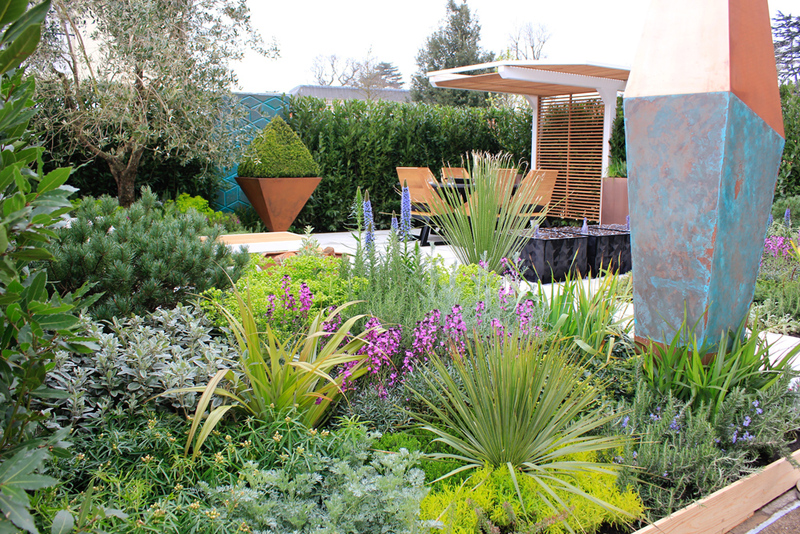 The show's organisers have correctly gauged what the public wants (imho 😌) - space, choice, inspiration, advice, food, plants and seating. The show was created because of a gap in Ascot Racecourse's spring calendar and steered to success by Stephen Bennett, previously Show Director for the RHS. So, what's on offer at the show? The big draw had to be the twelve show gardens, six by professional designers and six by hort college teams under the Young Gardeners of the Year competition. I'm sure in future years there will be more but, for this inaugural show, these were just enough to drink in all the detail. 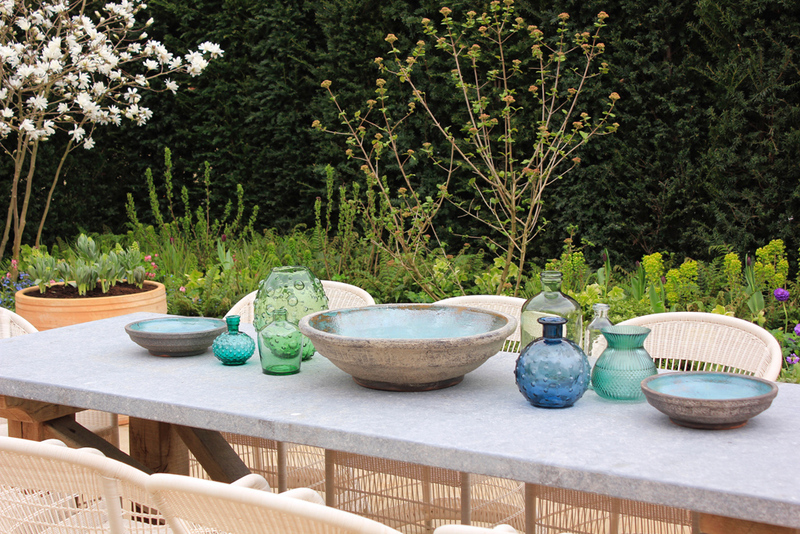 It was lovely to see how vibrant a spring garden could be and especially nice to see magnolias and cherry blossom being used in the designs - something not possible for summer shows. Then there was retail therapy. 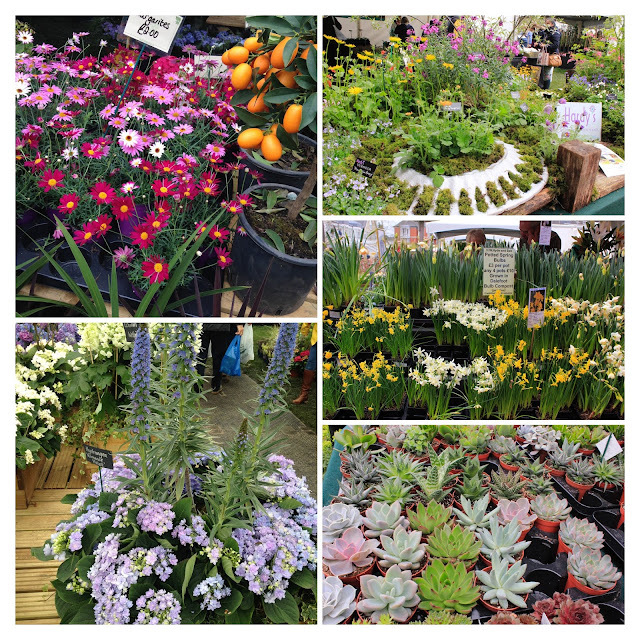 There were 33 specialist plant nurseries at the show, plus 58 trade stands selling all sorts of garden related ephemera such as tools, shoes, garden sculptures, landscaping, furniture and the most divine and highly desirable greenhouses. I think I may have stroked one or two of them while no-one was looking. The plant nurseries were especially popular as mid-spring is the perfect time to be thinking about what to do in your own garden - and filling any gaps for next year's spring garden before those thoughts are replaced by summer. ~ Love this display! 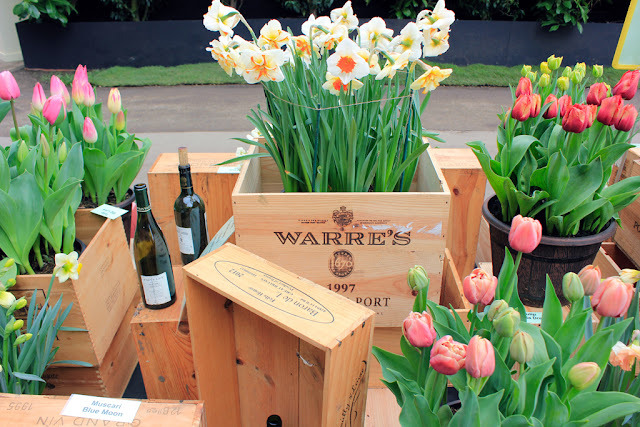 What a good idea, displaying pots of spring bulbs in wine boxes. Vodka? Viagra? Flight bags? The mind boggles. You can see why I might be curious. There were also talks from Pippa Greenwood (Grow Gorgeous Vegetables), floristry demonstrations from celebrity florist Simon Lycett and 'Plants for a Spring Garden' from the Keeper of the Garden at Windsor Great Park and his assistant. In addition, there was a giant screen overlooking the concourse (presumably in situ for the horse racing punters) so I was able to catch snippets of interviews taking place around the show and, I think, possibly some of the talks. As I was there in my blogger guise, I was given a Show Guide booklet as part of the press pack. As a nice surprise this was packed with useful and relevant information, with adverts kept to a minimum, and represented good value for the £2 cover charge. 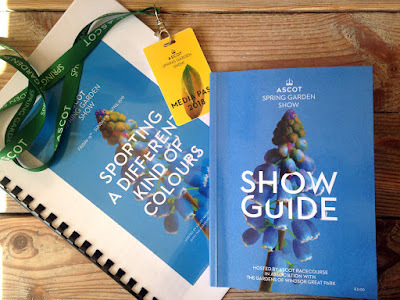 Altogether, I came away from the show happy and relaxed, feeling I'd chatted to some interesting people, been inspired by the variety of spring planting used in the show gardens ... and, of course, with a boot full of plants. Really, an excellent day. 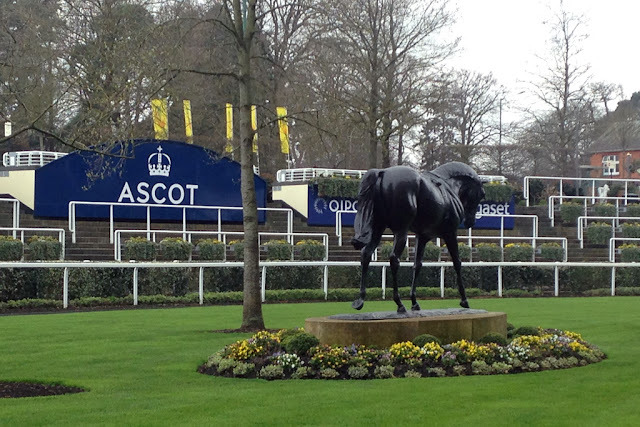 The show is hosted by Ascot Racecourse in association with the Gardens of Windsor Great Park. There's easy access through the Berkshire countryside from three motorways (M3, M4 and M25), plentiful free parking and a (very) local railway station. Next year's show is 12-14th April 2019. Sounds great for an inaugural show, a very promising start! Yes indeed - make a note of those dates, guys, and perhaps I'll see you there next year! I think it's a show that will go from strength to strength. very same niche as yours and my visitors would genuinely benefit from some of the information you provide here. I would normally mark this 'comment' as spam but have published it for two reasons. One - using the 'Contact Me' tab is a better way to get in touch with me; you can then introduce yourself properly rather than being 'Anonymous'. Two - I do NOT allow anyone to use/borrow my content, either words or pictures, without knowing exactly how and in what context they will be used. Anyone is welcome to link back to this site so readers can discover my blog for themselves. If this is a genuine enquiry, please contact me via the email tab at the top of the page so I know who you are. Thank you. I love reading your posts, and this made me feel so at peace. Guess you were at peace when you wrote it too. Sounds like a wonderful show & that sounds like one I would have thoroughly enjoyed. And the Unusual Gardening Techniques - I'm so intrigued! I often find that I enjoy the educational/speaker part of these shows just as much as the gardens themselves.